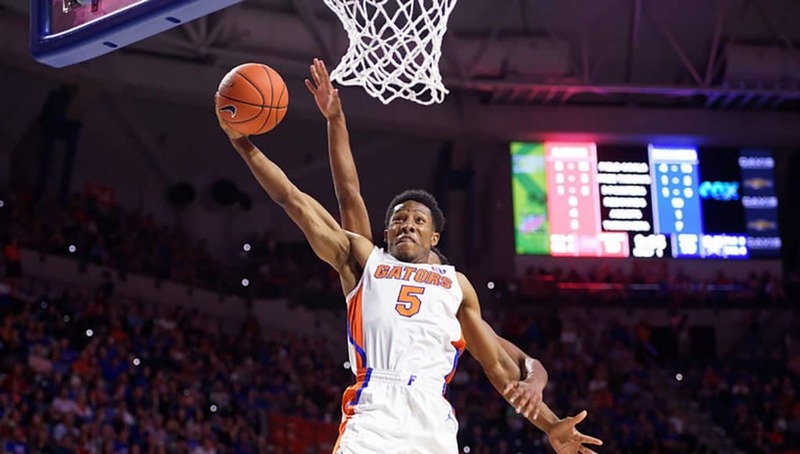 GatorCountry brings you a new podcast as we start to preview the NCAA tournament for the Florida Gators basketball team. 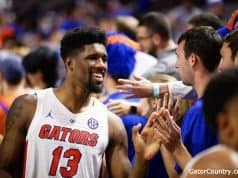 Andrew Spivey and Eric Fawcett breakdown how the Gators got into the NCAA tournament and recap the SEC tournament for Florida. Andrew and Eric also breakdown the key match-ups for Florida against Nevada in round one of the NCAA tournament on Thursday night. Andrew: What’s up, Gator Country? Your man, Andrew Spivey, back and with my man Eric today. We’re going to talk basketball, finally. Eric, it’s been a fun few weeks. March Madness is here. Eric: Yeah. I’m not sure fun’s quite the word. Stressful, with a little bit of a good outcome though. Obviously, Florida made things pretty interesting in terms of whether or not they’d make the tournament by losing out their last three games of the SEC slate. They lost to LSU and Kentucky, which are kind of losses you might have expected, but it was a loss to Georgia, which is probably the second worst team in the SEC, that actually put their kind of hopes of going to the big dance in limbo. They needed to make something happen at the SEC Tournaments in Nashville, and they did. I’m glad we’re here. I know a 10 seed isn’t super glamorous, but if there was ever a year to a be a 10 seed and go on a run, I think it would be this year, just because there’s not a lot of meat on the bone kind of after these top teams at the top of college basketball. I think things get pretty muddy at the three seed onward. Florida could rattle off kind of one or two wins, get out of the first weekend, which is still asking a lot. This could be really interesting. This is three straight NCAA Tournaments for Mike White. He becomes the first coach in Gators history to make [INDISTINCT] There’s also only two teams in the SEC that have made the NCAA Tournament three out of the last four years, and that’s Florida and Kentucky. Definitely some positive momentum for the program. Andrew: Eric, I won’t say that I follow this team closely, because that would be a lie. I followed it enough to know kind of how this team was. I really got into it in the SEC Tournament and different parts of the season. It almost seems like this is a freshman team with no seniors. You and I have talked about this. You and I text back and forth during the games. You have a good point when you say if Allen and Hudson would just give you something, this team would be really good. I guess you could look at it in two parts. You could look at it as these freshmen are really good. They’re able to carry this team. Or you could look at it and say, man, these seniors just really let us down. I guess you could go with that part. I know you agree with me to an extent, but is that really the truth of this team? Is this kind of a two-part team? Eric: It’s absolutely the truth. I mean, if we were talking before the season, and if somehow I knew that Keyontae Johnson was going to be a high caliber starting player in the SEC and Noah Locke would be the same way, I would think this team is Final Four bound, because I would have expected that Jalen Hudson would play like a fifth year senior and Kevaughn Allen would play like a senior guard that was a lot of people’s on their watch list to be the SEC Player of the Year. I mean, Jalen Hudson was on the Wooden watchlist. That’s the Player of the Year in college basketball, which is absurd, just looking at the season he had. There’s been a lot of games where Jalen Hudson has been a net negative on the floor, a lot of games, truthfully, depending on whether it’s your eye test or the analytics. He has been worse than a replacement level college basketball player, which for someone who was on the watchlist for college basketball’s Player of the Year that’s just crazy. This really has been a freshman team. They start three freshman, something that I would have never expected for this season. It does speak so much to just how good Keyontae Johnson and Noah Locke and Andrew Nembhard are, how they’ve been. I think a lot of people, like myself, expected Andrew Nembhard to start. I certainly didn’t think that Noah Locke and Keyontae Johnson would be in a position to do that. Just really big props to them for stepping up to the plate. You just can’t really tell the whole story of that situation without saying that Kevaughn Allen and Jalen Hudson have been disappointments. Andrew: I’ll say this. We’re not supposed to be fans of certain players and not of other players. There’s not a guy on the team that I don’t like or anything like that. Not saying that at all. I’m a Keyontae Johnson fan. Keyontae Johnson is a guy that I don’t know if you can hate that guy. I don’t know if you can say enough good things about him. He just is a guy. I say this, and no competitor likes to lose, but he has a drive about him that says, I’m not going to lose. Eric: He has this demeanor about him that, I mean, I think that if the referee said, if you rip down the nets with your teeth, you get to win this basketball game, he’d be up there. I think he also has the athleticism to do it. I mean, he has that demeanor about him, but he also has a lot of skill. I think that that’s something that actually gets kind of underrated when people see him play. I mean, he looks like he’s carved out of granite. Eric: He plays with that toughness that you’re talking about. I think a lot of people just kind of look at him as this really muscular, he plays really hard, but honestly, I think that undersells a lot of his skill. Because you don’t look at a guy like that and think, he’s really skilled. You think, that guy has got arms and legs that look like barrels, they’re so big. Really, he’s got a skill that is really better than anyone else on this team, and that’s the ability to get into the paint. He’s been able to attack closeouts and drive the basketball. That was a big problem for the Gators this year, and it’s something that you, me, and Nick talked about on the podcast a lot as a problem last year, that Florida just didn’t have enough guys that could make plays off the dribble and get in the paint. He can do that, just about better than anyone on the team, which, again, is something I didn’t really expect. Then he also has this shot that looks a little bit kind of mechanical, but he gets his arms straight. He gets his elbow up, and it’s actually a pretty good fundamental shot. It doesn’t look pretty smooth, but he’s just so muscular. I don’t think it looks super smooth, but it actually looks really good. I mean, he’s shooting 38% from three, which makes him kind of one of the best three-point shooters on the team. The results look maybe better than the jump shot does, but he’s got this skill to his game that I think kind of belies just his pure physical makeup. For that reason, he’s going to be such a good player going forward. That’s been one of the best stories of the year, that Keyontae Johnson has become. Just like you, I think he’s my favorite Gator to watch right now. Andrew: He’s one of those guys where you say, no, don’t shoot. Okay. It’s okay. I’ll be honest with you, Eric. Again, I don’t follow this team as closely as you do, but Keyontae Johnson was kind of one of those guys that was a forgotten about guy in the class last year. It was Nembhard and Locke. Those were the faces of the classes. Then you get a guy like Keyontae Johnson that comes in, and, like we say, he might be the guy who’s playing the best ball of this team right now. To get into the SEC Tournament and recap that a little bit, that steal he made in the LSU game was, in my opinion, the turning point of that game right there, where it was a chance that Florida was going to … They were losing momentum, for sure. It was about to get at a point where you thought there’s not enough time to come back. He gets the big steal, the layup. Florida goes on a run. Next thing you know, Nembhard’s hitting the game winner, and the Gators are going to the semis to face Auburn. When you look at that LSU game, Eric, it’s kind of the tale of the season, for me a little bit. That is play really bad at times, play really good at times. Eric: That’s got to be the unfortunate truth. I think a lot of it is because you got probably the two best scorers on the team, at least kind of in skill makeup and also how Mike White entrusts them is Kevaughn Allen and Jalen Hudson, who also have to be some of the most inconsistent players in the country. So, with that you’re going to have some ups and downs. Florida’s offense has had these kind of ups and downs. What’s kind of crazy is the fact that Florida, they didn’t leave that basketball game until they won it. LSU was leading the entire way. Florida won 76-73. That was their only lead of the ballgame. You pointed out just a really key thing about Keyontae Johnson. Even the steal he made, and just the fact that he can be such a great contributor on both sides of the basketball. I mean, I know people were kind of arguing this too, but I don’t think Florida’s in the tournament if they don’t beat that LSU team. I know they got in as a 10-seed, so it maybe looks more comfortable than it actually was. I think that win was massive for the Gators, and I don’t think they’re dancing if they don’t win this. It was Keyontae Johnson who turned that game around with that steal. He’s a gamer. He’s going to play a really key part of the basketball team here in the NCAA Tournament, however fall they go. He’s going to be a really key piece moving forward on a team that next year I know a lot of people are going to think maybe Nembhard coming back and Scottie Lewis and Tre Mann. I mean, I think Keyontae Johnson is going to be a central piece of this team. Andrew: Yeah. Let’s get into that Auburn game a little bit. That was a game that I don’t want to say was a consolation prize, by any means, because Florida had pretty much locked themselves in anyway. It was a game that I don’t want to say the team didn’t play hard in, because they definitely played hard in the game. It was a game that, in my opinion, if you look back at it, and you tell Mike White, you’re going to limit Auburn inside. You’re not going to allow them to rebound much. Mike White probably says, we win that game. But then it was the threes from Auburn, couldn’t contest any of them, and the turnovers. That just seemed like not a Mike White basketball team, a team that’s going to turn the ball over a ton and not guard the three-point line. Eric: I like how you’re mentioned, you’re like, I’m not going to say they didn’t play hard. I’m not going to say that, but they certainly didn’t play focused. They turned the ball over 19 times, and that’s so much. Part of that, to Auburn’s credit, Auburn is the #1 team in the country at forcing turnovers, and a lot of those turnovers were really good active hands by them, but a lot of them were just kind of brainless turnovers. Four from Jalen Hudson that were all just on kind of dribble drives, where he just kind of wasn’t ready. He was kind of driving without a purpose and got stuck, got trapped. There were five from [INDISTINCT] who just had some kind of unfortunate one stripped from his hands or go through. Kevaughn Allen just had a couple like weird travels where, again, he just kind of was playing with the basketball, not quite sure. Not moving around the court with kind of a conviction of what he was about to do next. Lost his focus and travelled. One thing that’s just actually crazy, Florida’s an elite defensive team that doesn’t score the ball super well. I mean, they shot 62% from the field, and that’s absurd. That should win you so many games. If you said before the game, Florida’s going to shoot 62%, I think they beat Auburn by 20 if you tell me that. Eric: Instead, the game was down to its final possession, and, obviously, we had a really big three from Auburn, who just has some guards that can absolutely hoist it. Then Andrew Nembhard probably gets fouled. Probably should have been shooting three free throws. Andrew: There’s no probably to it, Eric. He was mauled. He was tackled. That’s pass interference in football. No. He was fouled. Andrew: Yeah. I’m glad Florida was already safely in the tournament, because, wow, that would have been something. If that same called didn’t happen against like LSU, and Florida is in the NIT because of it. I mean, one thing that was, if there’s any kind of consolation, was the fact that Auburn went out the next day after beating Florida barely, and they absolutely hammered Tennessee. Just hammered them. I mean, that’s got to be something a little bit encouraging to the Gators at least, that you turned the ball over 19 times against Auburn and still were within one possession of winning. Then that same Auburn went and just absolutely hammered Tennessee in Nashville. That was decidedly a home crowd for the Volunteers. If Florida’s playing that well against Auburn, who just crushed a team that would have had a one-seed if they beat Auburn, I’d say that Florida’s playing some pretty good basketball at the time that they need to be. Andrew: To be honest with you, and maybe you disagree with me here, and that’s fine, outside of the Georgia game, they played well down the stretch. They’re a brain fart from Kevaughn Allen from getting a shot at beating LSU in overtime at home, and they played pretty well in the Kentucky game, except for a brain lapse at the end of the game there. This was a team that was on a winning streak before the Georgia game, and then went on a slide again. I think you can make the argument that the team really turned a corner in that Baton Rouge win, and the freshmen started to improve. I say freshmen, I use the old saying that Billy Donovan used to say, and that these guys aren’t freshmen no more. They’ve played a whole SEC season. They’re not freshmen no more. Still, this team has improved, until that Georgia game. Eric: Yeah. That Georgia game, that was bad. I’d say generally speaking Florida is playing their best basketball this season right now. Kind of here’s the fact of the matter to me, if Florida loses to Arkansas in the SEC Tournament, they’re definitely into March Madness. If they lose to LSU, they’re definitely not in, or I shouldn’t say definitely. I don’t think they’re in the bracket. Against Auburn, they’re already in comfortably. To me, they’ve played two do or die games so far this season, and they’ve won both of them. I think that that’s really encouraging going into the big dance, where it’s win or go home. 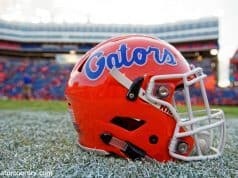 I feel like Florida’s played two win or go home games this year and have won both of them. The way they’ve been able to step up to those challenges, I think that that’s really good. That’s really encouraging as they play a Nevada team that’s pretty good. Even the Arkansas game we just kind of touched on briefly, but Arkansas was playing pretty good basketball, and Florida beat them by 16. I even think that’s kind of an indication of how Florida’s kind of been clicking a little bit better. Those turnover problems against Auburn were problematic, the fact they were able to shoot 62% of the field when they could actually get shot, because they didn’t turn the ball over, that is really encouraging. This team is going to defend. It’s just whether or not they can generate offense that’s going to kind of decide their fate. Andrew: Hopefully that’s not a problem next year. Let’s go ahead, Eric, and let’s get into this NCAA Tournament game against Nevada. A Nevada team that’s pretty good. You were telling me that some people had them as a Final Four team at the beginning of the year. They come in with a 29-4 record. That can’t be right. I’m looking at the media guide here, and it says 29-4 and 11-7 in their conference. That’s not correct. That’s not accurate. But a Nevada team that is a pretty good team overall. How does Florida match up with this team? Eric: Just for starters, they made the Sweet 16 last year. Except for one player, they brought everyone back from that team, and then they brought in a couple of just the most sought-after grad transfers in the country. A lot of Nevada’s players were already graduate transfers or true transfers. Just for example, the average age of Nevada’s starting lineup is 22.8. That is currently older than the Phoenix Sun’s starting lineup in the NBA. That average age, there’s only, Kevaughn Allen is 23 years old. Every single other player on Nevada’s starting lineup is older than anyone else Florida has on their team. This is a team of men. It’s a very unique team. So, every single player on their starting lineup, and even their kind of rotation is a transfer. They’ve built their team that way. That’s what you do when you’re Nevada. I mean, it’s worked out brilliantly for them, and now they’ve got this team of a bunch of really old dudes that now have a little bit of experience. That right there makes Nevada one of the most kind of unique teams in the country, just about how old they are. Then another thing that makes them so unique is that they do play really big. They’ve got these two brothers, Cody and Caleb Martin, who actually played AAU basketball with Jalen Hudson way back in the day. They’re 6’7” each, and they usually play in the backcourt. They’re using the point guard and shooting guard for that team, at 6’7”. Then they usually play Jordan Caroline, who’s 6’7” and Tre’shawn Thurman, who’s kind of 6’8”. Those are their four guys around the true center. They play very large. So, that is going to potentially pose some issues for the Gators, who are quite undersized. Andrew: You would think Florida would have an athletic advantage. You would think. Eric: They do have an athletic advantage, for sure. That’s the thing about Nevada is that they’re big, but they’re not great athletes. Another thing that makes Nevada so unique as well is that they isolate more than anyone I’ve seen in college basketball this year. They just love to go one-on-one. They get the matchup of Cody Martin, 6’7”, against someone else’s point guard, and they kind of space the floor, and then go one-on-one. It’s kind of schoolyard basketball. Eric Musselman was kind of an NBA coach. He was in the G League for a while. He secretly wants to do that again, because he just plays isolation G League basketball, which kind of works for them, because he’s got such a talented team. It’s going to be, I think, an easy kind of thing to scout for, because you know what’s happening. There’s nothing that Nevada’s going to do that really surprises you. Except it doesn’t really matter how much you scout, if they’ve got 6’7” guys that Noah Locke is going to have to guard in space, that could pose a challenge for the Gators. They’re really going to have to just figure out how they can keep defending these dribble drives over and over again from kind of like these bigger longer Nevada Wolf Pack players. 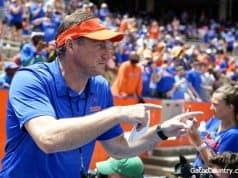 Andrew: The thing that I noticed in the LSU and the Auburn game was early on when both teams were really in the face of Nembhard and other guys and really trying to take away the pass, Florida would get very shot happy quick. That is the first open shot they got, they would take it, instead of making that third and fourth pass. I thought the SEC Network crew did a good job of talking about that. When Florida makes three and four passes, that’s when they’re at their best. That was something that those teams did a very good job of taking away, and that’s kind of where I see in this game. Can Florida make these guys guard them for 25, 30 seconds of the shot clock, or is it going to be 5 or 10 seconds, hit a quick jump shot? They’re going to get out rebounded in this game, most likely. Eric: That’s a very good point. Just because of the way that Nevada plays defense, they actually play fairly passively. They’re not a team that really extends their pressure and tries to make passing lanes congestive. They like to kind of sit back in the paint, and then they just kind of switch everything. Because they’re so long, they’re kind of just content to completely take away the paint, and then kind of say, we’re going to give you some half decent jump shots, but because we’re long, we’re going to get out there and contest a bit. For Florida, they’re going to see a lot of opportunities for B- quality jump shots, probably at any time during the clock, just because Nevada’s not going to extend. They’re going to play a little bit passively. The thing with Florida is, like you said, I think you’ve still got to look for a great shot, because you’ve got to know that at the end of the shot clock, you’re probably going to still be able to have a decent look. Shot selection is going to be really big. Another thing you said that was really smart was the fact that if Florida puts up a bad shot, Nevada is going to be able to rebound it and go, because they love to play in transition. If Florida’s chucking up a lot of bad threes, that means a lot of rebounds, and that means runout opportunities. That’s exactly what Nevada wants to do. They really like to push it in transition. They’ve got these really big players that when they get ahead of steam going towards the hoop, and it’s 6’7” powerful Jordan Caroline, and it’s Jalen Hudson trying to stop him, the referee sees bigger player attacking player. He assumes there’s contact. I certainly don’t want to see a bunch of and ones because Florida takes a bunch of scramble three-pointers, doesn’t stop the ball in transition, and lets Nevada get to the hoop. I think you kind of nailed it. I think this is a game where if Florida can play offense it’s going to feed into the defense. If they can get good shots and make them, Nevada can’t run out. If Nevada can’t run out and get fast break opportunities, their offense is going to slow down a little bit. How Florida can kind of be efficient offensively is going to just really set the tone of this game. Andrew: Here’s an idea for you. Drive and kick. Drive and kick. Just run with that motto this week. Eric: That would work. Noah Locke’s starting to look a lot healthier. He was drilling jump shots. He could be big in this game. If Kevaughn Allen can just take one or two dribbles towards the paint, Nevada, their defensive scheme is if someone starts dribbling towards the paint, everyone moves. Everyone tries to clog it up. That should give opportunities to get open jump shots. No need to take tough ones against Nevada. You should be able to get good balanced jump shots under control. Andrew: Please do not let Jalen Hudson drive in traffic. Eric: I mean, [INDISTINCT] when he drives in traffic, but yeah. This is what’s good about having a lot of days to prepare. I really hope someone is showing Jalen Hudson film. First of kind of the times he’s been turning the ball over or taking early bad shots when he’s driven it to traffic, and two, showing him some Nevada film and saying, if you drive the ball, you’re not going to have these opportunities to finish, but if you drive the ball just a couple times, but before you hit this traffic, you hit someone on the perimeter who’s open, because they’re about to collapse on you, they could have a lot of success. I really hope. I’m sure that’s going to be part of the scouting process and the preparation process. Andrew: Let’s look at this NCAA Tournament as a whole. We talked about Florida. Their second-round matchup is likely Michigan. Give me your take of this whole tournament in general. I’ll say this, before you give us the bigger breakdown, for me it’s kind of like a four or five team tournament, in my opinion. You got Duke, North Carolina, Gonzaga, Tennessee, Kentucky. Who am I missing? Michigan State. Who’s the other one-seed? I’m blanking on the one-seed. Who’s the other one-seed, Eric? Eric: I have no idea. I didn’t hear who you already said. Duke, Virginia, North Carolina. Andrew: Virginia. That’s the one I was missing. The four seeds, Tennessee, Kentucky, Michigan State. It’s kind of seven teams. Outside of those seven teams, it’s like okay. Am I wrong? Eric: Even there, Michigan State had a big injury at Langford. If people want to put them deep in the tournament, good for them. I’m not sure that will be me. I know they beat Michigan, but that Big 10, kind of the last game people saw before the bracket was announced. I think that they’re like Michigan probably should have won that. Michigan’s State’s looking really good. I just don’t think Michigan’s as good as a lot of other people think. I think they’ve been a little bit of fool’s gold. I look at this tournament, not a lot of the three seeds inspire me. I would really like LSU if they were to keep their coach, but that’s a team I’m not sure how focused they’ll be playing. Purdue’s a three-seed. They don’t do it for me. Houston’s pretty intriguing as a three-seed. Texas Tech is pretty intriguing. Generally speaking, this is a pretty top-heavy tournament. For that reason, some of these 6-11, 7-10, those games there could be some interesting type upsets. I wouldn’t be scared of anyone picking a 13 over a 4 in this tournament. Just because I don’t feel like there’s a lot of quality past those top teams. As much as it’s not very fun to put a bunch of one and two seeds in your Final Four, I think this might be the year that happens. Andrew: I’m a Duke hater, but I’m all for seeing Duke-Carolina Part 4. Eric: Yeah. I don’t love Duke. I don’t like Duke, but that really is the best rivalry in college basketball, in my opinion. I would love to see that again. Obviously, at full strength Duke probably feels like they’ve got the edge in that one. If they get all the way to the finals, that would be a matchup that would certainly make all the tv executives ecstatic. I think I’d be happy too. Andrew: I’m begging for my Hawks to continue tanking and get Zion to go with Trae Young. I like that duo. Eric: That’d look all right. Andrew: It would look all right. Eric, we’re going to get out of here. Tell everybody where they can find you on Twitter. You can always find Eric’s stuff on Gator Country. He’ll have plenty of it during the game, after the game, before the game, all that good stuff. Tell them where they can find you on Twitter, and we’ll get out of here and see everyone after the Tournament. Eric: You can follow me @EFawcett7. At Gator Country I’ve already got my first preview for Nevada. I’m going to have one tomorrow or so that’s with a really talented writer from Mountain West Wire, who knows Nevada better than anyone. He’s going to help me out doing the little previews. I think I might have even one more in the works that’s going to be just a really deep dive into the analytics of how Nevada isolates so much, and what Florida can look for specifically. This is exciting. I think it’s going to be a really fun matchup. I hope everyone enjoys it. Andrew: Heck. I’m going to say this. We’ll see everyone when Florida gets to the Sweet 16. I’m calling it. Eric: Yes. Let’s do it. I’m just looking forward to our next podcast. Andrew: Next podcast after this. Eric: If we’re calling it, our next podcast can be previewing Montana, who we can hope to upset Michigan. Andrew: That’s cool too. I’m all for watching the Wolverines go down. Guys, we appreciate it. Check us out on Gator Country. Check out Eric as well. We will see everyone on the next podcast.